Regular followers of Tinsel & Tine know other than Oscar Night, and a very few other posts here and there, that this is not a cooking blog. I highlight & promote foodie events, like the Alex's Lemonade Fundraiser at Yangmings; and Food products, like our recent #BreakfastNight promo for Krusteaz; Philly restaurants, even chains, like the roll out for Cheesecake Factory's new menu items; Foodie Films, like Almost Christmas; and new food industry sites, like our recent campaign for Renzell Restaurant Ratings; along with our upcoming post featuring a food in film book called "Movie Night Menus". So when Kory Aversa of Aversa PR contacted me to say I'd been chosen to be one of the contestants for this Philadelphia Florida Keys & Key West, Food Influencers Cook-Off taking place at The Restaurant School at Walnut Hill College, my first thought was to turn it down. My second thought was to put either my sister, LeVonne Lindsay, a very good cook, or my friend Denine Gorniak (The Bicycle Chef) in my place, and I'd handle the promotion and social media. But Kory said no, it had to be the actual "Philly Influencer" competing, and besides, Denine was also a contestant. That really made me not want to participate, as Denine is a chef and graduated from The Restaurant School at Walnut Hill College. But then, he said the magic words, not the chance to win an all expenses paid trip to the Florida Keys, YES! I did want that. I haven't had a vacation in 8 years. But the magic words were the @thefloridakeys tourism had been trolling everyone's social media for over a month and some bigger outlets were not considered because their social media was not as tight as mine @tinseltine - Then I'm in! Here's a little video from the evening, featuring Chef Bobby Stoky, which gives you an idea of the scope and fun of the night. I'm in the background near the end of the video looking lost, as I couldn't find a grater to zest my lime. Note: Video and all social media embeds will not be visible to those receiving T&T via RSS Feed. I really appreciated my sister LeVonne @Leonas_Lovequest and my BFF Diane Roka @dianeroka attending to cheer me on! This was my cheering team last night during #flkeyscookoff @dianeroka & @leonas_lovequest Can't wait til Diane posts her drawing of me at my station. It really did feel like a Food Network celebrity cooking competition! Thanks bestie & sister for being in my corner! 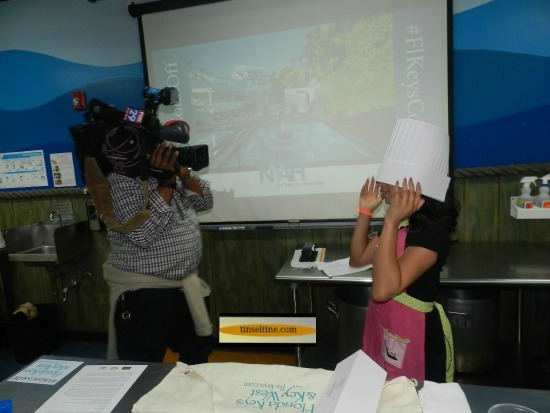 Diane captured me first in action, in my chef's hat and the Florida Keys apron each contestant received. And then below, in ink, as Diane is an illustrator. We make a good tag team capturing and documenting events around town. And on occasion, she'll cover an interview for me, like this example during the PEANUTS Anniversary. You may be wondering, what in the heck has Florida tourism got to do with Philadelphia? 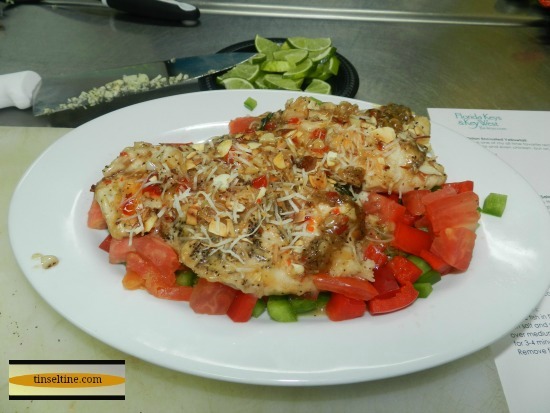 Well, this #FLKeysCookoff was the kick-off to the currently running Florida Keys and Key West Campaign at Philly's 30th Street Station, where you'll find a colorful display enticing you to get away to the Keys! The below video gives a little more detail and features the winner Colleen Kennedy of Souffle Bombay, she has a beautiful website and is a major cooking blogger. 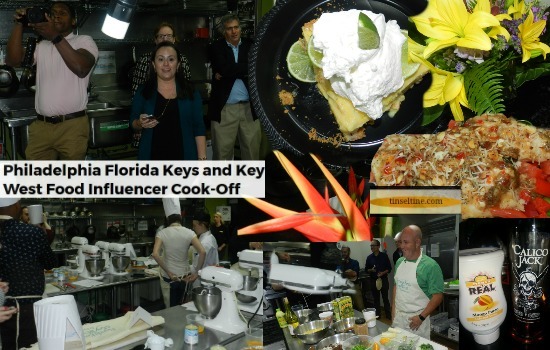 I know the #FLKeysCookoff was all in fun, and for exposure for all involved, and I had a great experience; still, I think they needed two trip winners, one an actual chef with a food site, and one who is just a Philly Influencer, as there were contestants who were radio personalities, morning show hosts, fashion bloggers etc.. who really don't cook, or even watch "Throw Down with Bobby Flay", myself included, so we really didn't have a shot at winning. Note: their were runner up winners with undetermined cooking backgrounds: Best fish dish - Chris Balbi and Steve McCann from Philly Gay Calendar and for Key Lime Pie - freelance writer Sarah Maiellano was allowed to cook with her husband Joe Maiellano. Although, I will say, as I did in the photo essay, I was proud of the way both my Keylime Pie and Island Style Coconut Milk Red Snapper came out, both aesthetically and deliciously, so I suppose that's all that really matters - except, I still wish I was packing a suitcase of island wear and heading to the Keys! There's one fast shot of my fish dish poaching right before I cover it the way real chefs do, not with a lid, but another frying pan. It's at 0:58 - 0:59 don't miss it! LOL!